An engine hoist is a thing you might need every once in a while, so why not have one in your garage? Instead of constantly paying to rent, or bother your friends, you can simply buy an engine hoist. This 4000 LBS Engine Cherry Picker Hoist Shop Crane 2 Ton is a good choice when it comes to engine hoists. The 4000 LBS Engine Cherry Picker Hoist Shop Crane 2 Ton is made out of premium steel, which guarantees that it will last long, and work good. The boom range is 102″ from the floor. 4000 LB is the closed boom capacity, and maximum height is 48″. 1000 LB is the extended boom capacity, and the maximum height is 102″. This engine hoist is perfect for smaller spaces, as it can be folded. The working dimensions are 65″ x 41″ x 37, and when it is folded 58″ x 37″ x 22″. It can easily be stored anywhere when you are finished with it, and this is a major advantage. This one is also very easy to move around. It has 6 fully rotating steel caster wheels (3″). 4000 LB (2 Ton) is a big lifting capability. You can use for both engine lifting, and general moving around the shop, or your garage. 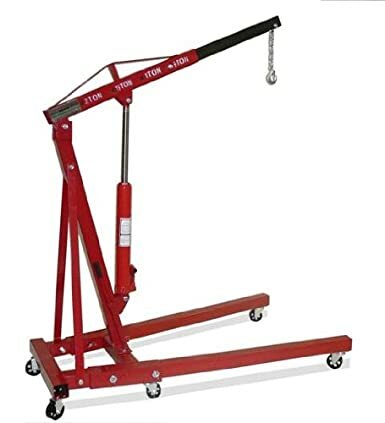 Another good thing is the price, you get a hoist made completely out of steel, very easy to manoeuvre for a price of 250 $. Of course there are cheaper and more expensive choices, but the customers are very happy with how this engine hoist works, and say that they never regret buying it. One of the considerations is that you really need to make is the width between the two legs. You need to make sure that you will be able to get close enough the the object that you are wanting to lift.